We all react differently to stressful situations whether it’s a physical response or an emotional outburst. We can all learn to control how we react by applying mindfulness. Mindfulness is the act of bringing awareness to the present moment by acknowledging and accepting thoughts, feelings and sensations in the body. We’ve all been in situations or moments where it feels like we’re going to lose it. Someone’s words or actions may have bothered you, or maybe you experienced an end result that didn’t go your way. It’s easy to get caught up in the moment and fire back a reaction too quickly, without being really aware about what just happened. The following videos are life-like, situations that highlight the use of applying mindfulness to everyday activities. The end result: Being mindful throughout the day will help stressful situations result in a more positive outcome. Mindful movement means slowing down. Being present in what we are doing at any one time. By practicing mindful movement we can slow down to hear or discover what we are thinking and feeling. We can then allow that pause to help us decide what to do with the feelings or thoughts. Practicing mindful movement can help us in our everyday lives. There are movements that calm, movements that energize, movements that help with sleep, movements that ignite gratitude and movements that improve athletic performance. Eagle Pose – beneficial for quieting the mind and bringing the attention to the body. Legs Up The Wall Pose – a simple but effective anxiety-busting posture that calms the chatter in our minds. 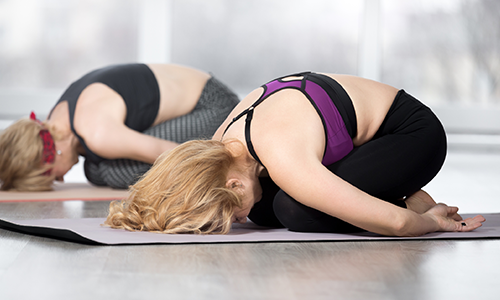 Fish Pose – can be used for fatigue and anxiety relief, as well as gentle back and shoulder stretching. Beginners may want to place a thickly-folded blanket beneath the head for neck support if they are experiencing any discomfort. Standing Forward Bend – forward bends are excellent for calming our nervous system, providing a release of the upper body and soothes the mind through gentle inversion. Balancing Poses – quiet the mind and cultivate focused awareness. Childs Pose – stimulates your nervous system and helps reenergize your body. Warrior II – awakens and energizes the body and empowers strength. Chair Pose – awakens and energizes the body and empowers strength. Upright Cat & Cow – a seated version of the classic cat/cow move is designed to move energy through the spine, by activating through rocking the spine back and forth without putting pressure on it. 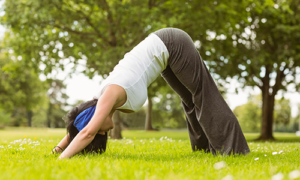 Easy Forward Bend – creates an overall sense of ease in the body while opening the hips. Plow Pose – turning the blood flow around can bring the body a calming sense of vitality, great for sleep. Corpse Pose – gets the body into a relaxed state to focus the attention on the breath and calming. Spinal Twists – gentle twists relieve tension through the spine to rinse out tension from the day. Reclined Butterfly – helps the body get ready to rest and observe the breath. It can be helpful to place one hand on the heart and one hand on the belly to feel the rise and fall of each inhale and exhale. Seated pigeon – improves mobility. Cobra – releases pressure in the spine. Dolphin – stretches the upper back and shoulders, hamstrings, calves and foot arches at the same time. Frog – improves strength of connective tissue around the ankles and knees, which makes it a great warm-up movement prior to lower-body exercises. Supported Backbends – they very lightly stretch tight spots, while giving athletes a chance for deep relaxation, which speeds up recovery. Reclined Big Toe – strengthens the knees and can target the IT band (a common tight spot in runners) and can relieve backaches and sciatic pain. Using a band/strap makes it accessible for everyone. Boat Pose – increases abdominal and hip flexor strength. Bow Pose – stretches the front of the body, improves posture and strengthens the back muscles.